This recipe is from the book Churrasco Grilling the Brazilian Way by Evandro Caregnato. It is on page 180. This recipe makes 10 -12 cups of soup. Prepare the roux by mixing the flour and butter together in a 10 inch pan. Chop the onion, carrots, pepper, and celery into small pieces and set aside. If you are using whole lobsters, remove all of the meat and save for garnishing or for another recipe. Place the lobster shells between 2 clean kitchen towels, and use a rolling pin or the side of a small frying pan to break the shells into 2 inch pieces. Put the shells into a 10 x 12 roasting pan. Place in the oven and roast for 10 minutes or until the shells turn pink. Remove the pan from the oven and add the chopped vegetables, garlic, sugar, tomato paste, and butter. Sprinkle with salt and continue roasting in the oven for 25 minutes, or until the edges of the vegetables show some light charring. Transfer the ingredients from the roasting pan into a 2 gallon stockpot. Add the water, cayenne pepper, and tarragon. Use a fine mesh strainer over a bowl to collect the liquid. Strain the contents of the pot. Remove any pieces of lobster meat and reserve. Discard the shells and transfer the strained stock back to the pot. Over moderate heat, bring the stock to a simmer. While stirring with a wire whisk, slowly add in the roux 1 tablespoon at a time until blended. Add the heavy cream and brandy and raise the temperature slightly, just below boiling. Stir constantly for about 2 minutes to heat through. Add a touch of salt to taste. 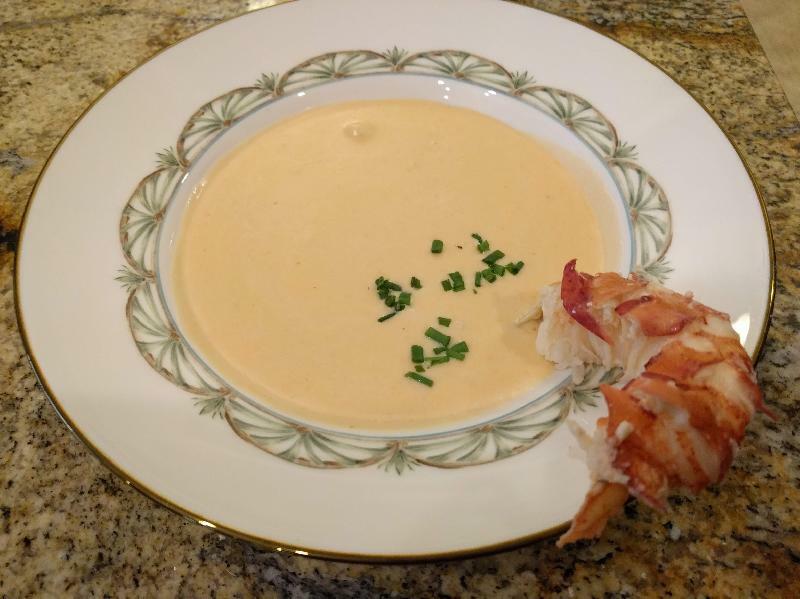 Serve the bisque in warm bowls and garnish with the reserved lobster meat and fresh chives. I also cut up lobster meat into very small pieces and placed it in the soup. This is not something you have to do. I just personally enjoy the soup with bits of meat in it.